Fill a wide thick-bottomed pan with about 1 1/2″ of oil. On med-high, heat to 350°F (if dip a wooden chopstick in oil, bubbles should come off of it). 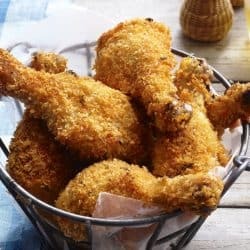 While oil heats, put flour in a medium bowl and toss the chicken wings in the flour to coat them. Lightly shake off excess flour. When oil is hot, fry chicken wings in batches. 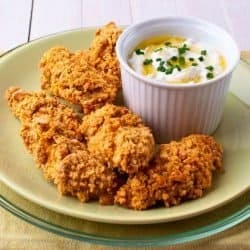 (Add just enough chicken wings to create a singular layer so you don’t overcrowd the pan.) 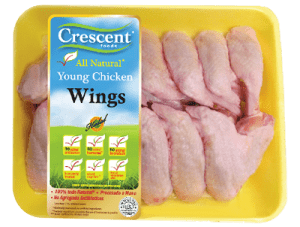 Fry the chicken wings for about 5 minutes, flip them, then fry for another 5 minute or until golden and crispy, As each batch finishes, place on an oven safe dish, cover with foil, and place in oven to keep warm while you cook the rest of the chicken wings. While frying the chicken wings, melt butter in a medium saucepan over low heat. Add sriracha, honey, sea salt and lime juice, then stir to combine. Keep warm over low heat. 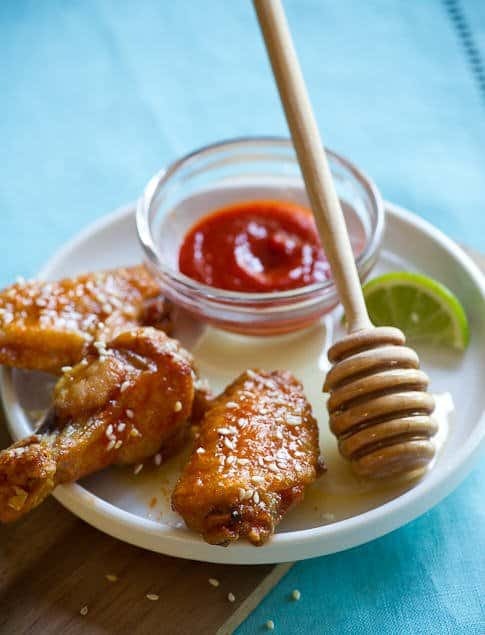 When ready to serve, toss chicken wings with sriracha-honey sauce, plate, and garnish with cilantro and sesame seeds.